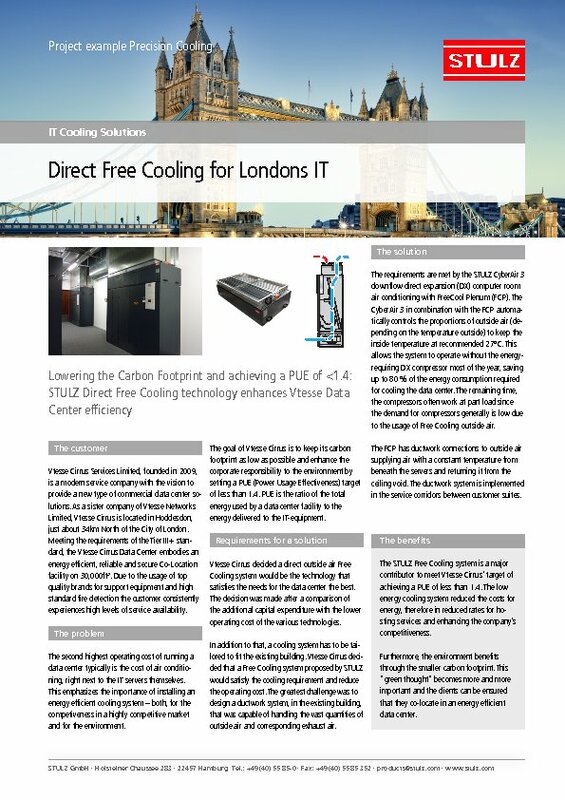 Lowering the Carbon Footprint and achieving a PUE of <1.4: STULZ Direct Free Cooling technology enhances Interoute (Vtesse) Data Center efficiency. Vtesse Cirrus Services Limited, founded in 2009, is a modern service company with the vision to provide a new type of commercial data center solutions. As a sister company of Vtesse Networks Limited, Vtesse Cirrus is located in Hoddesdon, just about 34 km North of the City of London. Meeting the requirements of the Tier III+ standard, the Vtesse Cirrus Data Center embodies an energy efficient, reliable and secure Co-Location facility on 30,000 ft². Due to the usage of top quality brands for support equipment and high standard fire detection the customer consistently experiences high levels of service availability. The second highest operating cost of running a data center typically is the cost of air conditioning, right next to the IT servers themselves. This emphasizes the importance of installing an energy efficient cooling system – both, for the competiveness in a highly competitive market and for the environment. The goal of Vtesse Cirrus is to keep its carbon footprint as low as possible and enhance the corporate responsibility to the environment by setting a PUE (Power Usage Effectiveness) target of less than 1.4. PUE is the ratio of the total energy used by a data center facility to the energy delivered to the IT-equipment. Vtesse Cirrus decided a direct outside air Free Cooling system would be the technology that satisfies the needs for the data center the best. The decision was made after a comparison of the additional capital expenditure with the lower operating cost of the various technologies. In addition to that, a cooling system has to be tailored to fit the existing building. Vtesse Cirrus decided that a Free Cooling system proposed by STULZ would satisfy the cooling requirement and reduce the operating cost. The greatest challenge was to design a ductwork system, in the existing building, that was capable of handling the vast quantities of outside air and corresponding exhaust air. the compressors often work at part load since the demand for compressors generally is low due to the usage of Free Cooling outside air. The FCP has ductwork connections to outside air supplying air with a constant temperature from beneath the servers and returning it from the ceiling void. The ductwork system is implemented in the service corridors between customer suites. The STULZ Free Cooling system is a major contributor to meet Vtesse Cirrus' target of achieving a PUE of less than 1.4. The low energy cooling system reduced the costs for energy, therefore in reduced rates for hosting services and enhancing the company's competitiveness. Furthermore, the environment benefits through the smaller carbon footprint. This "green thought" becomes more and more important and the clients can be ensured that they co-locate in an energy efficient data center.